A sandwich is a sandwich, but a Manwich is a meal! As I have already mentioned, today I share a birthday with my cousin Jason. A week ago he e-mailed me and requested that I create The Ultimate Manwich for his birthday and post it on Pinch My Salt. No other instructions or descriptions were given. He just asked for The Ultimate Manwich. I actually love it when I get requests to create something! Remember Ruby’s request for Pumpkin Scones? Jason makes these requests fairly often but they are usually off-the-wall combinations of ingredients that I don’t bother to take seriously. However, I knew I could come up with a good Sloppy Joe recipe so I was excited about this one! Those of you who aren’t in the United States probably have no idea what a Manwich is. 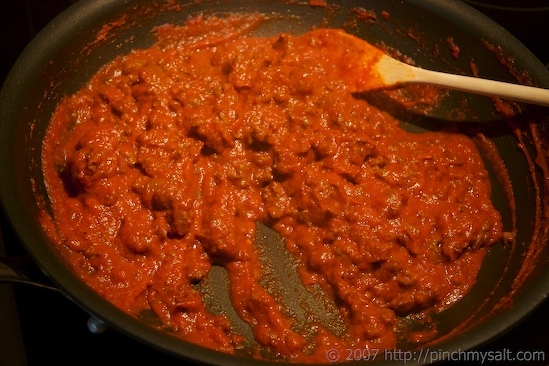 Manwich is the brand name of a seasoned tomato sauce that is mixed with cooked ground beef and put on a hamburger bun or bread to create a sandwich. 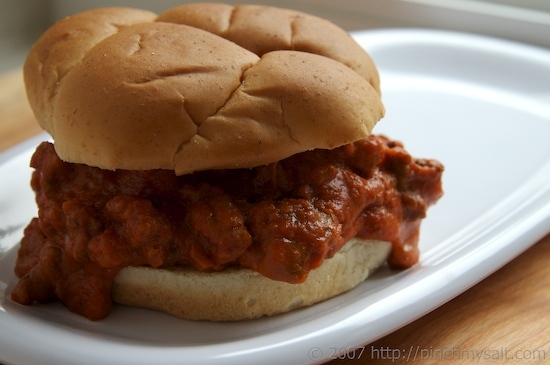 The sandwich is typically called a Sloppy Joe although I am sure there are other names for it. I’m pretty sure I liked to eat manwiches as a kid, but I am really not a fan of the canned Manwich sauce nowadays. I tried it a couple years ago and swore I would never buy that stuff again. Yuck! But, Sloppy Joes are fun every once in a while so now I just make them from scratch. I’ve even previously written about one of the recipes I tried but, I’ve always wanted to come up with a better one. In order to make a traditional Sloppy Joe recipe into an Ultimate Manwich, I knew I needed to add something extra. Sloppy Joes are often a little sweet (sometimes a lot sweet). Since I love the combination of sweet and spicy, I knew I would first have to add some extra heat. I could have just added extra crushed red pepper or thrown in some fresh chiles. But it occurred to me that one more flavor would go perfectly with the spicy and sweet. Smoky! I decided the perfect solution would be to add some canned chipotle peppers in adobo. Chipotles are smoke-dried jalapeño peppers and in grocery stores you will often find them canned in adobo sauce. The chipotle in adobo would add both the spice I was after and a hint of smoke. And the delicious adobo sauce adds even more flavor. Now I knew I was on to something but I thought I might need one more thing to make this sandwich ‘The Ultimate.’ What’s one ingredient that makes just about everything better? No, not bacon (although the thought did cross my mind). Looking at my list, I knew it was going to be good before I even started making it! I picked up all the ingredients yesterday afternoon and had planned on making these then. But as you might have read yesterday, I lost my momentum and decided to make them first thing this morning instead. So this morning I got up and gathered my ingredients. 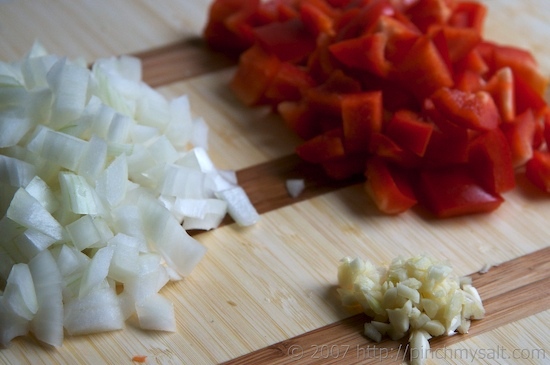 First, I chopped the red bell pepper, onion and two cloves of garlic. I also chopped up one chipotle chile and set it aside. 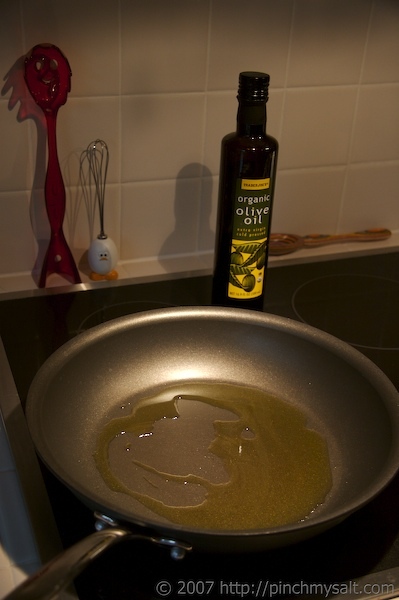 I poured a couple tablespoons of olive oil into a large skillet and turned the heat to medium. 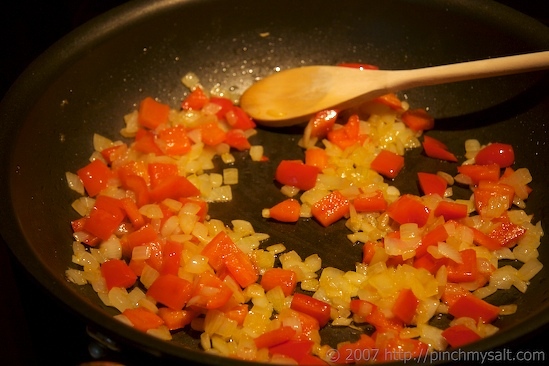 Next, I added the onions and red bell peppers (not the garlic yet). 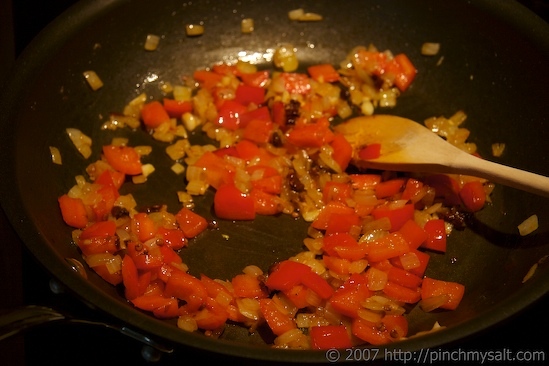 I cooked the onions and peppers over medium heat, stirring regularly. This is what they looked like after five minutes. But I kept cooking them until the onions were just slightly brown and the peppers were getting soft. After seven minutes, I added the garlic and one chopped chipotle chili and cooked, stirring, for one more minute. Then I added one 15 oz. 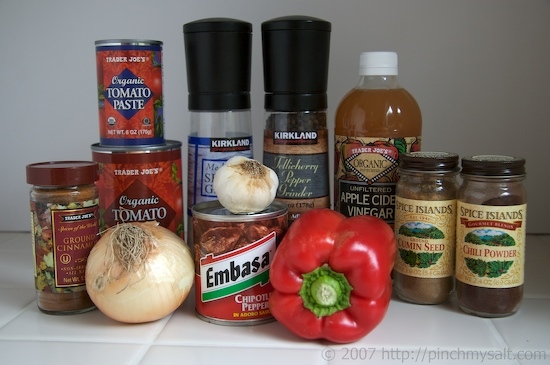 can of tomato sauce, one 6 oz. can of tomato paste, one tablespoon of apple cider vinegar, one tablespoon of adobo sauce from the canned chilies, 2 tablespoons of brown sugar, 1/2 teaspoon ground cumin, 1/2 teaspoon kosher salt, and a dash of cinnamon and I stirred it all together. I didn’t forget the chili powder, I just ended up not needing it after all. I was tempted to add more salt at this point but decided that since I wanted to season the ground beef as it was cooking, I would wait until the end to decide if it needs extra salt. Since I wanted the sauce to be somewhat similar in appearance to what comes out of the can, I decided to puree the mixture in a blender. I let it cool slightly then spooned it into the blender. 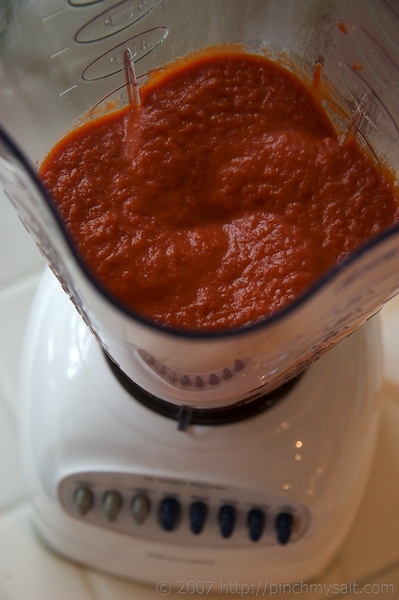 I then pureed the sauce until it was fairly smooth. 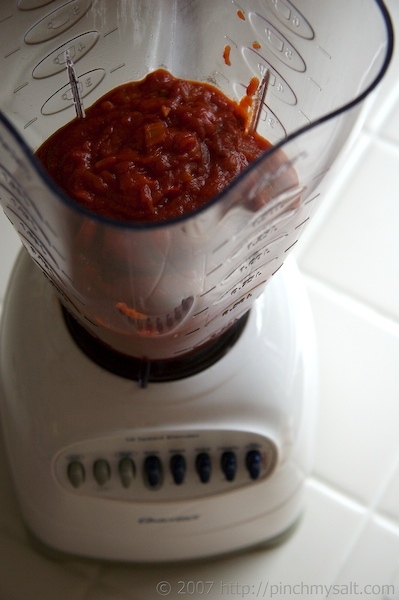 After it was the consistency I wanted, I just let the sauce hang out in the blender while I prepared the ground beef. 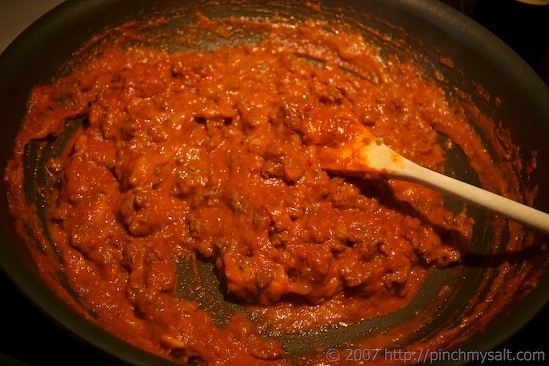 I started by rinsing and re-using the same skillet I had used for the sauce. 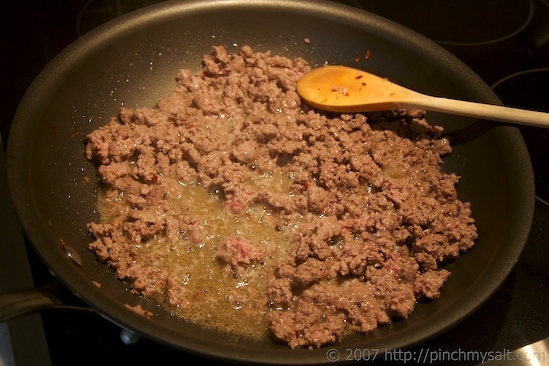 I heated the skillet over medium heat and crumbled about one pound of ground beef into the pan. While it was cooking, I seasoned the meat with half a teaspoon salt, some fresh ground black pepper, and a generous pinch of crushed red pepper. I cooked the meat until it was almost fully cooked but still a little pink in some spots. 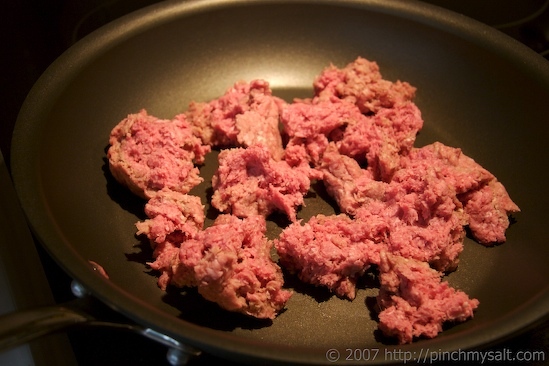 As you can see, my beef wasn’t very lean! But that’s ok, because I just poured off all the fat. 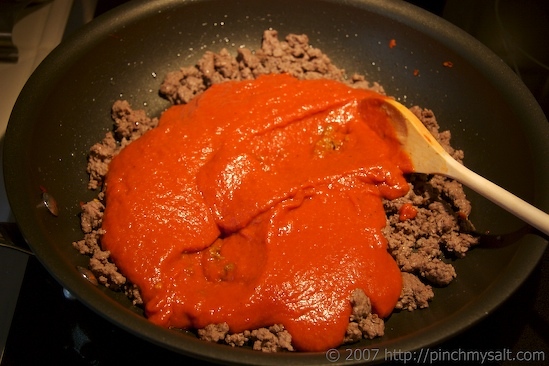 After draining the fat off the ground beef, I poured in all of the sauce from the blender. I stirred it all together and set the heat to medium-low. I cooked the mixture, stirring constantly until it was bubbling and had thickened enough to where it was ‘moundable’ enough for a sandwich. Then I turned off the heat. Now it was time for the cheese! I chose yellow cheddar over white because it matched the color of the sauce. 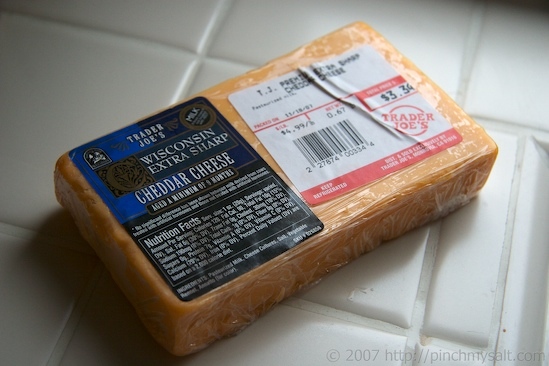 I shredded about one cup of cheese (3 oz. or so) and added it to the sauce mixture. I gently stirred in the cheese and my Ultimate Manwich filling was finished! It was now ready for a bun. Guess what I ate for my birthday breakfast? Yes, I really did eat this at 10:30 a.m. for a late breakfast. I hadn’t eaten yet and believe me, this sandwich was pretty irresistible. I couldn’t finish it all but that’s because I had overloaded it with meat for photographic purposes, but I’m pretty sure that Jason would have eaten the entire thing if he were here. So, that was Jason’s Ultimate Birthday Manwich. And guess what I have decided to call it? I had to name the sandwich after him because even though he doesn’t have a food blog, Jason was nice enough to create and name a sandwich after me in honor of my birthday. That’s right, Larry David isn’t the only one. There is now a sandwich called The Nicole. Hope you have enjoyed my saucy beef sandwich experiment. I will have the recipe written out in standard form and added to the end of this post soon! Yummy!!! That looks like a wonderful breakfast... ;-)Happy birthday to you both!!! I love sloppy joes. I've never had the canned kind, but I grew up on these. I haven't made them in forever - maybe it will be my easy Friday night dinner! Excellent Work, now I need somebody to make it for me. Nice touch with the napkin. I prefer to use another piece of bread to clean up.Happy Birthday to us both indeed. Happy Birthday to you both!! Thanks to both of you, I'm not very hungry (and I already ate lunch) ;-)My husband loves Manwich (yuck!) and so I think as a special treat I will borrow your recipe and really knock his socks off. Thanks for sharing! I meant, "I'm NOW very hungry"...not "not very hungry".See I'm so hungry that I can't type correctly. Heh. The Sloppy Jason - nice! Now for my birthday, I want you to drive up to Fresno and make Jason a "Sloppy Jason" so he wont bug me to do it! By the way.....what do I get for my birthday??? In the coincidence department, we made Sloppy Joes today for a late lunch/early supper. Quinn *loves* them. I must admit that yours look and sound better than mine. I hope your birthday has been great! Interesting... Coming from Australia, I can't say I've heard of the canned Sloppy Joe variety, but I regularly add "Man" to the front of any dish that is of significantly greater proportions than a it should be.ie: Manwich, Manburger, Man-steak, Man-chop etc...Come to think of it, there is an inherent implication of meat in any Man dish... a Man-falafel just wouldn't work at all.Anyway... here's one of my past efforts in Man-dish makinghttp://abstractgourmet.com/2006/10/the-manwich/Lovely work :) I'll have to give this one a go sometime. In honor of your birthday, here's a little song, Nicole. It's sung to the tune of Happy Birthday: Happy birthday to you, Happy birthday to you. Happy birthday, dear Nicole... Happy birthday to you! Happy birthday! What a fun way to celebrate. Nicole, the manwich looks great and the chipotles win this guy over. Hippo Birdy to you!I have to say that 'The Nicole' is a bit feminine of a name for that sandwich. :) My wife laughs when I do that type of sandwich, because I have to have potato chips on it, too.. It's something about the sloppiness going so well with the crunch. Happy Birthday! My fiance eats like a 10 year old, so he might actually try this. Thanks for a spiced up version of a classic kid favorite! I never thought of naming my creations. But I guess I would have to come up with my own creation first. I love that you just whipped that sandwich together, no big deal. I have to follow a recipe, except with maybe pasta. The Sloppy Jason looks great. And so does the Nicole.Happy Birthday!! Thanks for this recipe! I like the idea of putting Chipotles con Adobo in with it. I wouldn't have thought of that. I made tortilla soup yesterday and was going to have that for dinner again, but I think I'll make this instead. I think I have all the ingredients (except the buns) in the kitchen! Including grass fed ground beef.Great idea, that just hits the spot! That's one dang good sangwich you got there! 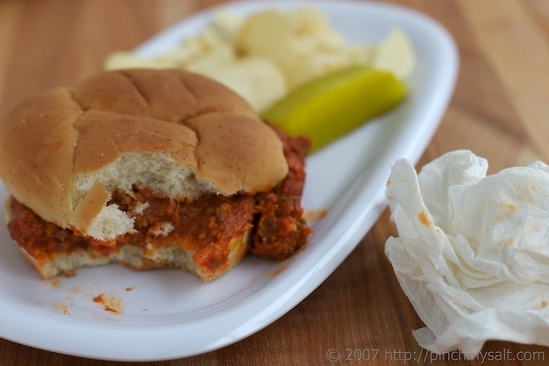 Over the years, when researching the Sloppy Joe sandwich I leaned that Ssme folks claim that the Sloppy Joe sandwich was first created in a cafe in Sioux City, Iowa in 1930 by a cook named Joe. At that time it was called a "loose meat sandwich". Other accounts suggest that the Sloppy Joe sandwich was created in Cuba and that it was named after "Sloppy Joe's Bar" in Havana. The earliest versions of this sandwich consisted of spiced ground meat and nothing more. 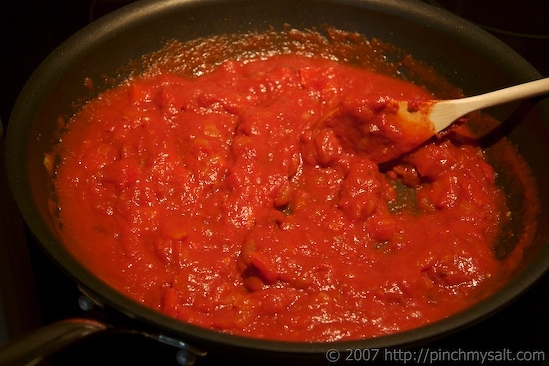 Later on, cooks began to add other ingredients such as tomato paste. Today, in northeastern Pennsylvania, this sandwich is known as a "wimpie" and in parts of southwestern Illinois it's referred to as a "yip yip" sandwich. In New Jersey, a Sloppy Joe sandwich is unlike all others as it contains sliced deli meats such as turkey or ham, coleslaw, some sort of sliced cheese, Russian dressing and is served on sliced rye bread. Ooby dooby, it's all good eatin! Happy Birthday Nicole!! !Haven't heard Manwich for awhile. I'm going to have to try this recipe. Also, it's good to know another November person - my birthday is on the 26th. Happy Birthday! Hope your day was Mantastic! get it...manwich, mantastic...anyways, it's Extra Sloppy here in Everett, we have about 2 inches of snow, can't want to go boardin'. Happy Birthday, and have a great weekend! Nicole I just made up your sloppy Joe recipe. YAY! It's quite good. I didn't put in quite as much Brown sugar, but everything else is the same . Thanks! That brings back childhood memory. A manwich was a real treat. Good thing I bought a bucket last week. Now I'm placing it under my chin to hold the excessive amount of drool that floweth. And I just ate!By the way, loving the new theme and the rotating headers! 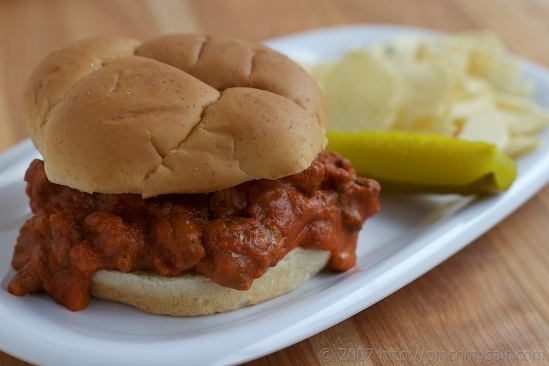 I haven't had a sloppy Joe is years, but this recipe is making me CRAVE one. Wowza. I think it's safe to assume I will be putting this into my "how to get a guy" recipe box (if I had one)! I would have eaten the whole thing...maybe not in one sitting! And look at all those food labels in English - does that seem strange? Oh, my mother always made Sloppy Joes with tomato soup...yeah, they were good! I just wanted you to know that I used your onion cutting technique that you talked about a while back to make some pasta sauce last night, and it's the first time ever for me that I've gotten through cutting an entire onion without having to stop and rinse out my eyes or take a break. I'm extra susceptible to the onion demons, and this worked really well for me. Thanks! HAPPY BIRTHDAY NICOLE!! You should have stuck a candle in your b-day breakfast manwhich;). You're pictures are gorgeous (as always). Happy B-Day!! God you explained every steps ;-) Good job! I recently made a baked pasta dish that called for a mix of ground lamb and ground veal. 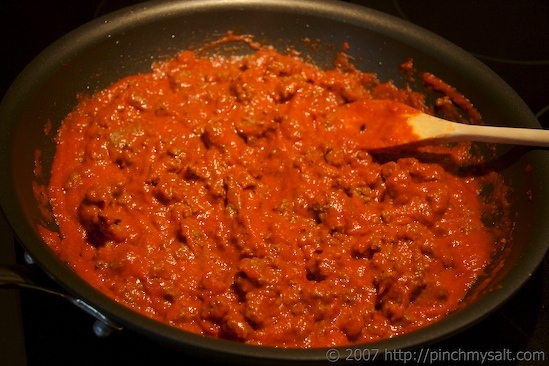 The browned meat was added to a fairly straight forward red sauce before being combined with the pasta. 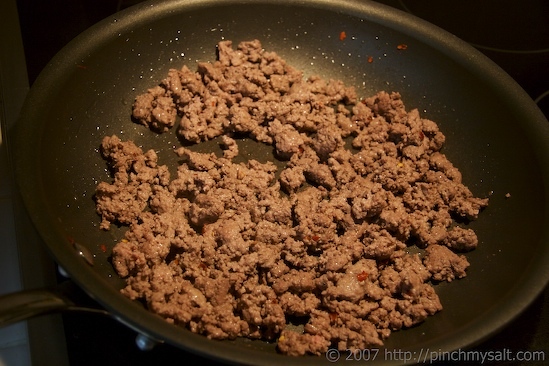 When I sampled the mixture at this point, I knew that I would eventually try a Sloppy Joe or a Manwich with at least a mix of ground lamb and beef, if not ground lamb and ground veal. The taste was fantastic. 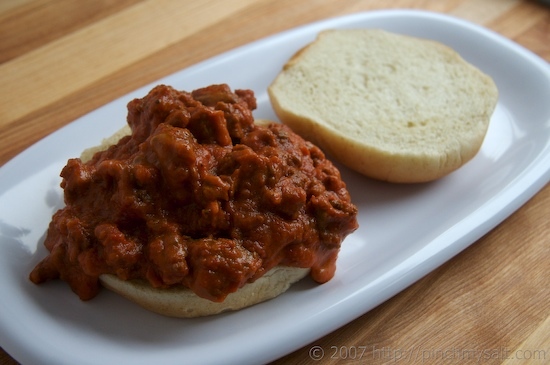 I think it would add something very nice to the typical sloppy joe.Your recipe sounds fantastic....particularly the addition of the chipotles, which seems an excellent way to give the sloppy joe a deep and "mannish" quality. Oooh, I love the addition of chipotle! Happy bday :). YUM----my dad used to make Sloppy Joe's for us when we were kids---but I agree that a "from scratch" version seems FAR better and even a tad more---dare I say---sophisticated! LOVE the chipotles in it----they have amazing flavor (and color). 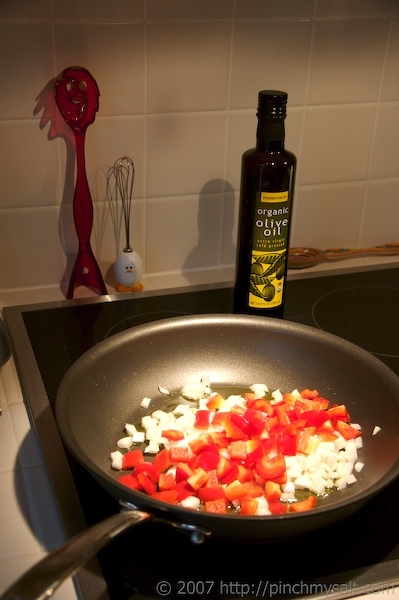 BTW----love your Trader Joe's Organic Olive oil in the photos---the same one I use---love it! Happy Birthday! wow, this looks like a serious eatster! Wow . 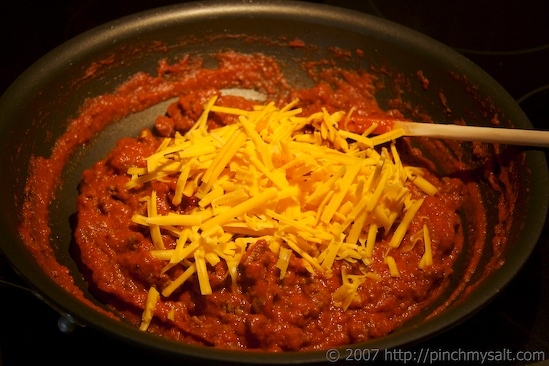 . . cheddar in sloppy joes (I mean sloppy nicoles) . . . revolutionary. I'll have to give it a try.And hey . . . I'm still waiting on a braise . . . ;-)Happy birthday, Nicole! Good idea. And if there was an award for 'most photos in a blog post to illustrate a recipe', you'd have it, hands down. :) Happy birthday! Great looking manwich. I like how you have photographed the process step by step. Excellent job.That is one filling meal for anyone. i feel questionable, although it may tickle your timbers, i feel questionable serving a sizeable portion of manwich to anyone with a history of good ole, porking out, therefore this whole thing is unattractive. verily. I have a history of "good ole, porking out?" Yes, Jason, apparently you do! I tried out this recipe with a few minor changes....and it was fabulous! Thanks for sharing such a wonderful dish...I'll definetly be making this again. Jen: So glad you liked it! Feel free to share your changes...I'm constantly changing my own recipes and it's always good to hear suggestions! hey, same birthday! AND i have a young cousin with the same! you're a girl after my own heart, but obviously with a lot more talent! i love the fresh ingredients, not to mention i can make a double batch and freeze some for later in the month for an easy meal on a busy night! my family will love you for this! Oh my, I love "Manwhich" the season pack not the can. This recipe does temp me though! The chipotle makes it a Sloppy Jose, eh?? Bueno!! 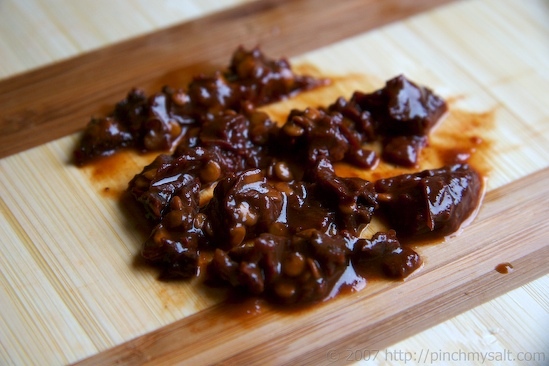 i tried this and the homemade bbq recipe and i would have to say that this is the best out of the two!! i love that it is spicy and sweet at the same time. you have to taste it to understand exactly what that means! :) even my 8 year old son, who HATES bbq sandwiches, LOVES this one, and even wants seconds. he told me to never make the "other stuff" (manwich in a can) and that it is "nasty". glad that fresh, easy to make, full of vegies bbq satisfies my kids!! i don't think i will tell them no when they request this for dinner! I never heard of manwich but i think it is also good with pasta instead of buns. Love the post. That sure is a 'Manwhich' of note. Not for the faint hearted. I'd like to see my brother try and eat this. He's always telling me how much he can eat. Oh boy does that manwich look absolutely delicious! Thanks for blowing my diet! yes but take most of these ingredients and put them in an omlette and then a bit of hot sauce on top with a sprinkle of feta.... now you have breakfast. You, my pal, ROCK! I found just the info I already searched all over the place and simply could not locate it. What a perfect web site. Can't wait to make this for my boyfriend. He loves things like this especially where a napkin is required! Implementing yet again work outs with regards to every day feet is usually astonishingly sensible plus boasts considerable cure in the on the spot together with potential. this is fantastic, thank you so much for sharing! How have you have the ability to create such a excellent audience involving commenters to your web page? I have been making this recipe for about 4 years now. Every time the chilly weather creeps in- someone asks for it. From fall until spring, this is on our menu regularly! We love this good ol' fashion, updated for the times, manwich!